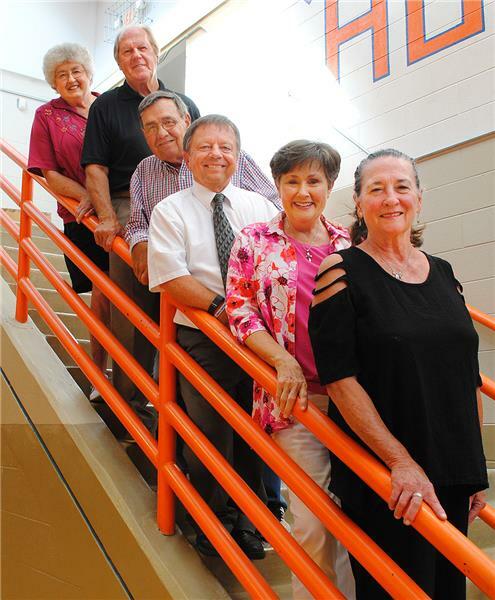 East Ridge Hall of Famers: East Ridge hall of fame committee chair Catherine Neely (top) joins five members of the class of 2015 hall of fame. (top to bottom) Ed Foster, Jimmy Starling, Lynn Goss, Leslie Williamson, Cheryl Gannon. The induction ceremony will be Sept. 25. NCAA and high school track champions, a pair of teammates who were also May Queens, a wrestling hall of famer, former coaches, multi-sport athletes and a longtime principal highlight the second class of the East Ridge High School Hall of Fame. The 10 newest members of the school’s hall of fame will be inducted next Friday (Sept. 25) during halftime of the East Ridge-Hixson football game at Raymond James Stadium. From Lynn Fox (NCAA champion, 4x100 relay) and Becky Herd Lively (TSSAA state mile champ) who could really run, to May Queens in successive years - Leslie Williamson, the state’s best shooter a half century ago, and Cheryl Gannon (basketball and volleyball teammates) - to Lynn Goss who had his hand raised as champion on the wrestling mat many a weekend in the mid-60s, to all-city (Jimmy Starling and Chuck Strickland) and all-state (Mike Odom) football players to the late Mike Olinger who coached several sports and Ed Foster who served as school principal for 11 years. “This is a great hall of fame class and a good representation of the 1960s and beyond,” said hall of fame committee chair Catherine Neely. 7. MIKE OLINGER (deceased) - COACH BASKETBALL - 1979-1990 - Basketball coach at ER - 1979-1994, Coached Golf and Track at ER, Coached Basketball at Madisonville. Had record of 235-162 … his son, Travis, will represent his dad at the induction ceremony ... Travis has coached Basketball and Football at ER as well.